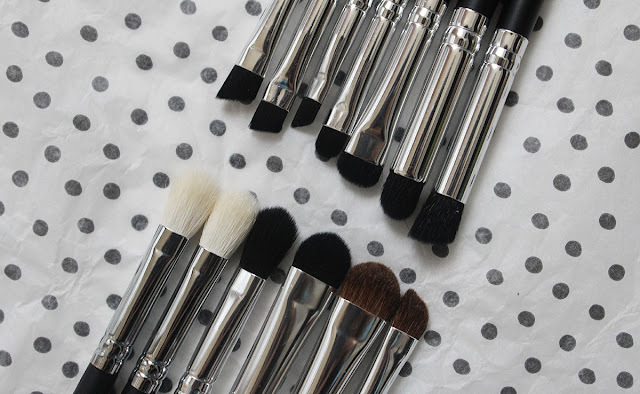 This is the second part of my Coastal Scents brush haul and I recommend you read my last post about the face brushes I ordered to get a sense of my overall impressions of the brushes, company and order experience. I ordered twelve different eye brushes and besides the Pro Blending Fluff (BR-250), which was about $2.50 after the 50% Black Friday discount, each brush costed me less than $2 each. So even if there isn't a sale, almost every eye brush will set you back about $4. - Classic Blender Synthetic (BR-C-S06) - This is a basic synthetic hair blending brush in a similar shape to the Pro Blending Fluff. The bristles are soft and splay out less on the sides than the Pro Blending Fluff. This will make a fine brush for applying and blending a transition color in the crease. - Pro Blending Fluff (BR-250) - I bought two of the Pro Blending Fluff brushes because they are supposed to be a dupe of the MAC 217, which is one of my most reached for eye brushes. The Coastal Scents version is a bit less dense and a smidge less soft but still comparable and will make a fine blending brush. - Classic Shadow Medium Natural (BR-C-N02) - This is quite a large dome eyeshadow brush that is very soft and dense. I think this will be great for packing on shadow for people with large eyelids but as I have small lids, this would be better to sheer out color all over the lid or for a highlight under the brow bone. - Classic Shadow Medium Synthetic (BR-C-S02) - This is the synthetic version of the previous brush and is equally shaped and soft but with a little less give. I prefer synthetic brushes for blending out cream products so I will most likely use this to apply and blend out cream shadows. - Classic Blender Doefoot Synthetic (BR-C-S07) - I was very excited to get my fingers on this brush because it has a unique slanted shape and looks perfect for blending out cream shadows and adding a bit of color to the outer corner of the eye. I do not have any other brush that looks like this and think it's a great "specialty" brush for the price. - Classic Brow Synthetic (BR-C-S14) - I'm not really sure why this is labeled as a brow brush as it looks more like a smudge brush to me. I love the Japonesque Travel Smudge Brush in my Wantable box so I wanted a full sized version in my collection. This Coastal Scents brush is very soft and I think I will get a lot of use out of this. I want to get the natural haired version of this next time around. - Classic Shadow Dome Synthetic (BR-C-S04) - This is another unique brush to my collection and one that looks great for applying a concentrated eyeshadow to the outer corner of the eye. The super soft synthetic bristles make it perfect for blending cream shadows as well. - Classic Shadow Angle Natural (BR-C-N05) - Without a doubt, this is the most disappointing brush out of the entire haul because this brush sheds like crazy. I am not sure if I received a defect or if all the N05 brushes are this poorly made but hairs come out left and right when I stroke the brush. The brush is now very sparse and not dense enough to do much of anything. - Classic Detail Round Synthetic (BR-C-S12) - I'm not sure what I plan on doing with this brush yet because it can be used for a variety of things. Perhaps I could use it for very fine detail work like placing color on the inner corner of my eyes but most likely I will turn it into an eyeliner brush or a smudger brush. This could also work as a spot concealer brush. - Classic Angled Liner Medium Synthetic (BR-C-S18) - The last three brushes are all angled liner brushes in different sizes. I love angled liner brushes whether I am setting pencil liner with eyeshadow or applying cream liner. 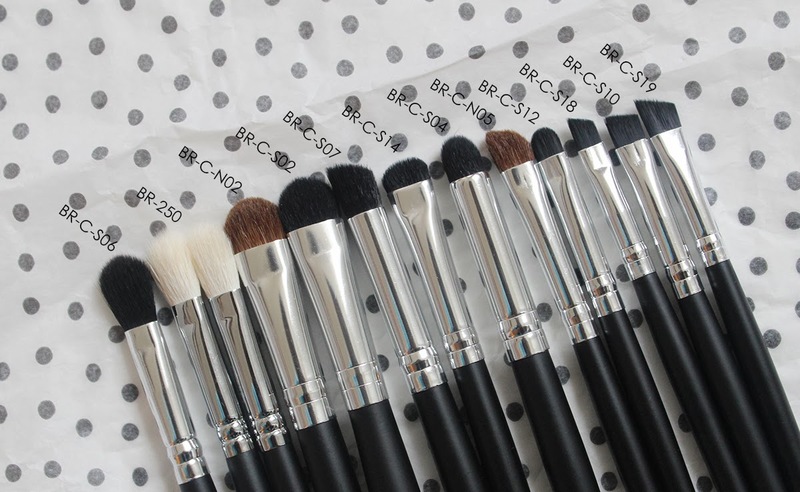 Although the S18 is called the medium brush, it actually is the smallest of the three brushes. - Classic Angled Liner Synthetic (BR-C-S10) - This brush is the most "regular" sized angled liner brush and would probably also make a good brow brush. - Classic Angled Liner Large Synthetic (BR-C-S19) - The large angled liner brush is indeed large and I'm hoping it won't be too big to comfortably line my eyes. It might take one or two times to get used to the size of this brush but I have high hopes that it'll be great. Overall, I am very happy with the brushes I purchased from Coastal Scents. For a little more than $40, I have 22 new brushes to add to my collection that are not perfect but still very good quality. Until January 2nd, Coastal Scents is offering 40% off everything and I highly recommend their brushes!